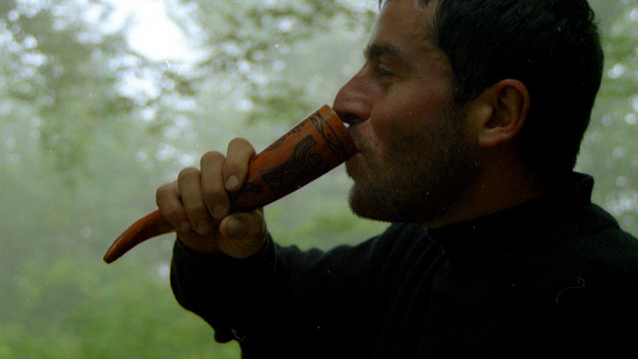 The Kantsi is a horn to drink wine from. In all parties the Kantsi is passed around. Wine is filled to the rim and every male must empty it in one big gulp. The depicted Kantsi is a very tiny one of ceramics. is the amount of food on the table. It is like the Garden of Eden; full of temptations all piled up. Dishes of meat and khachapuri are buried under yet other dishes of bread, sauces or whatever comes from the kitchen that day. 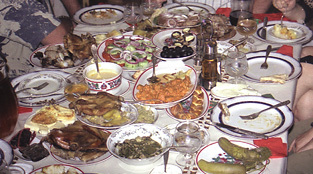 A Georgian meal normally consists of 8-10-12 or more dishes with different food. I won’t even try to explain what everything is. Join the Facebook group ”Khachapuri”! All basic food is bought fresh from the bazaar, and don't come from some low-price super marked, or in frozen pieces. 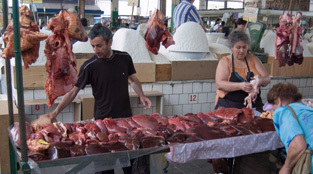 Most of the meat come from small farms. Industrialized low quality food-production does not exist here. The taste of the food is therefore exquisite, and the way they prepare it brings out a number of different and exiting flavors. Georgian food is something for the gourmet. It’s certainly not for those measuring calories, though. Every dinner party must have a Tamada, a toastmaster. 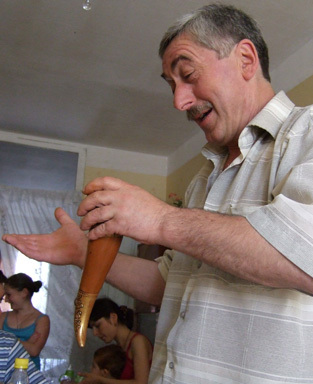 Wine is imperative, and the flow of it is controlled by the Tamada. He is the master of the toasting; a very important job. And it is a lot of toasting going on. First for all friends, all their ancestors, (all dead ones too), for Sakartvelo (Georgia in Georgian) and for whatever needs to be toasted for: The GAUMARJOS (cheers). The Gaumarjos is always introduced by a long speech giving the reason for the toast. This goes on for hours. After some Gaomarjo'ing the men usually become significantly more macho, and there might be singing and sentimental speeches. And more wine. Then the women, which doesn’t drink much, decides that their housbands have had enough and must go home. from a cow or a bull, able to contain several liters of wine. You are supposed to drink it all without stopping. This is a hazardous game you can't win. Don't even try. The Kantsi in this picture is a miniature urban little thing. The "real mac coy" has a very different size and impact. 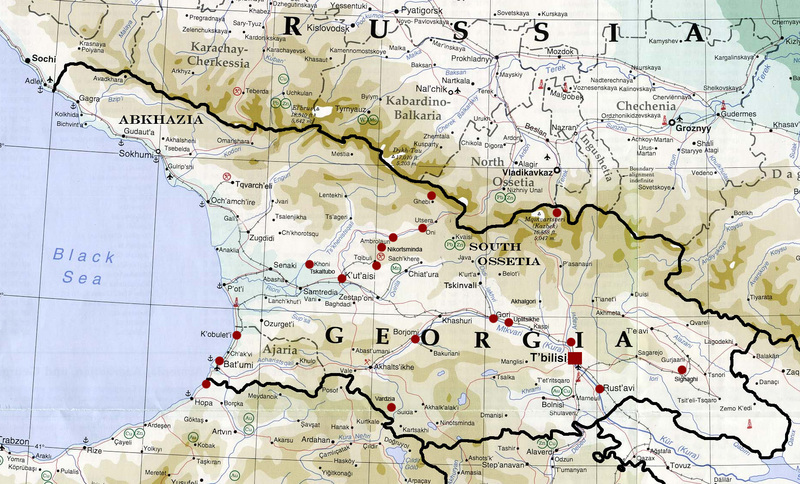 The Georgian Table is indeed the most varied and exiting way of eating I have tried. Tasteful and creative use of the best raw materials available. You definately won't be served fishfingers and other industrial processed garbage here. The Tamada at work, holding a speach and the Kantsi. This is Tsitsinos table, first round. She's a professional. 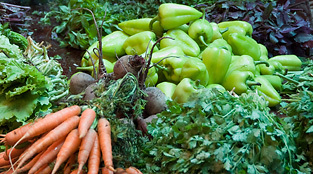 Fresh vegetables at the bazar..
Fresh fish and meat of all kinds. I think it's heaven. 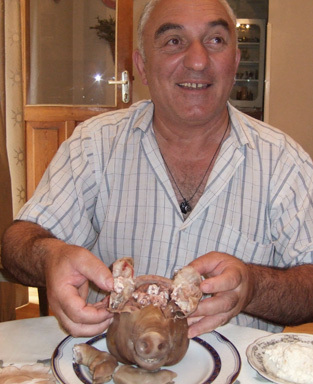 They eat pigs brain. It tastes like salty porridge.